Properties in Otautu Bay average 4.5 out of 5 stars. Property 2: Cute Colville Farm House - be active or RELAX !! ~ Kaka Cottage ~ Little Bay - Bookabach Best Eco Friendly Bronze 2015! Property 15: ~ Kaka Cottage ~ Little Bay - Bookabach Best Eco Friendly Bronze 2015! Stunning ocean views, hidden gem close to beach. Very private and quiet. Property 16: Stunning ocean views, hidden gem close to beach. Very private and quiet. Waitete Bay Beach Retreat - NICE! Property 22: Waitete Bay Beach Retreat - NICE! 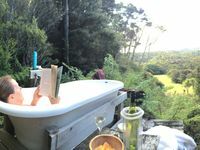 Whare iti - couples studio, amazing views. 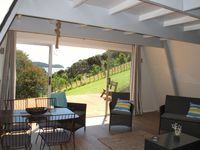 Property 37: Whare iti - couples studio, amazing views. Arani - chalet with island views. Property 40: Arani - chalet with island views.